Each portrait Kristi Elias creates is a unique work of art that is relevant and appropriate to its subject. Last year, Elias won a Sunset Print Award at the Professional Photographers of California state competition for You Won’t Bully Me, a grungy portrait of a young martial arts competitor. Elias followed up this year, taking home another Sunset Print Award at the California competition for a decidedly different subject, entitled Waiting for You. This portrait purposely evokes Renaissance art. “I wanted a painterly feel with a lot of detail in the props, like the bottle. There’s note in the bottle, and you can see the contours and the detail. There was a lot of time put into those details of the portrait. You can see even the music on the floor, and all the shading and detail in it. I did it just like it would have been as a Renaissance painting, and how they paid so much attention to detail on all the props,” explains Elias. The portrait of her client, who also poses for Elias to spark modeling ideas, was captured in the studio. Elias purchased a custom dress from Bulgaria for an authentic touch. Elias added a new background, a photo she took of a Gothic cathedral in Tuscany. She used Photoshop, Nik Software and Alien Skin to edit the image. “When I edit I don’t use the same actions every time. I look at each portrait as its own piece of art. Some of it is my own custom actions, and some of it is edited with Nik Software to bring out the detail in the shadows. I like to put a lot of detail in the shadow for that hopeless romantic look. I took any painterly effect off of her skin so there’s no texture on the skin, because that doesn’t go well with judging,” says Elias. Master printer Jonathan Penney, Center Moriches, N.Y., printed the image on a fibre-based paper to complete the beautiful, Renaissance-style portrait. 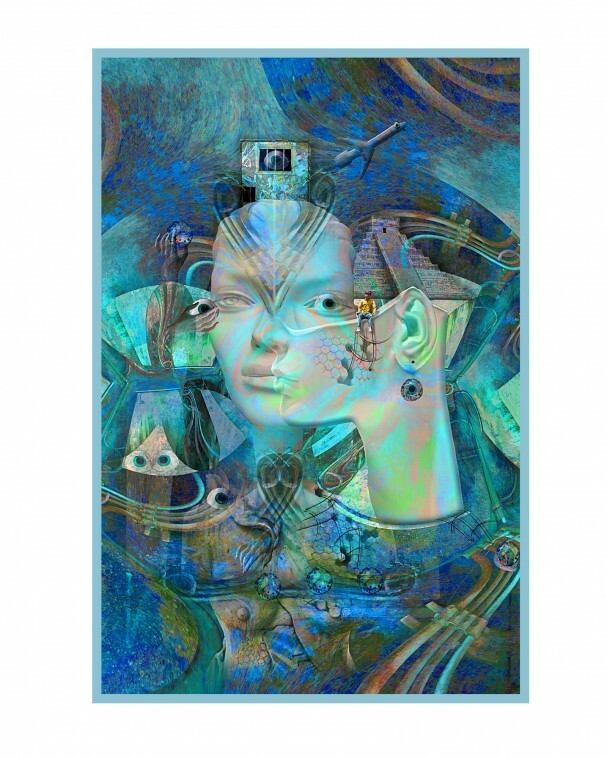 “I like surrealism,” says Elaine Hughes. That much is evident in Hughes’ Sunset Print Award-winning piece entitled Chaotic Profiling. Hughes also won a Sunset Print Award in 2013 for the surreal and aptly titled Dream World. Chosen by judges at the recent PhotoPro Expo 2015 Print Competition in Covington, Ky., Chaotic Profiling was hard to overlook, and look again to catch all the subtleties in the dreamlike world Hughes created. “There are many ways to interpret life. In this image we see the profile of the main subject intertwined with a secondary version of itself. This way of looking at things can create chaotic thoughts. The concept of my image is the end result,” says Hughes. Note the child enjoying his time by the ear of the main figure. “Maybe he lives here in this strange, chaotic and magical place,” adds Hughes. Hughes’ surreal dreamscapes take months to create as she gathers photos she takes on her travels with her husband and former Sunset Print Award winner Robert Hughes and combines them into one cohesive (or chaotic, as the case may be) image. “I take photographs everywhere I go. It could be something in the hotel room, outside the door, or anything I find interesting that I might be able to use. I also study a lot of animated films and art for inspiration,” she says. All the photographs are combined in Photoshop and blended in multiple layers. With hue and saturation Hughes finds just the right color scheme to convey her concept. For this one, the plays on blue seemed just right to her. 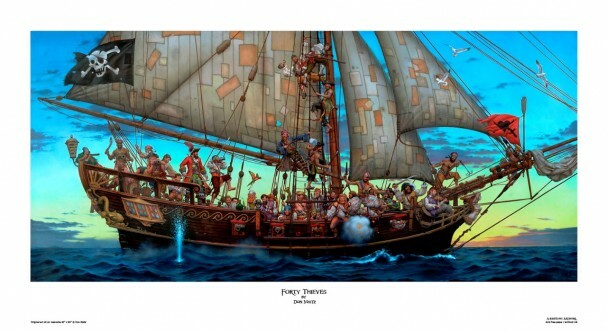 The Tampa Bay History Center is featuring the original work of fine artist Don Maitz as part of its exhibition, The Art of Piracy: Pirates in Modern Culture. The exhibition began on Jan. 24 and runs through April 26. Maitz is famed for creating the original artwork for Captain Morgan’s Spiced Rum when the adult beverage was first brought to market to be properly swilled. The exhibit examines the role of art in shaping the popular and iconic images associated with 17th and 18th century pirates in and around the Caribbean, Gulf of Mexico and Atlantic seaboard. 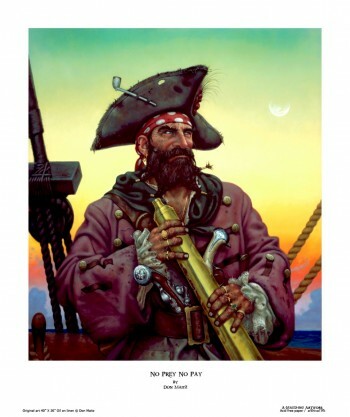 Originally from Connecticut, and now based in Sarasota, Fla., Maitz’s interest in pirates and sea rovers goes back well before he moved to the Buccaneer coast. The move simply made his pursuits in pirate art even more appropriate. “A lot of artists and illustrators had moved west and were doing western art. Since I moved to Florida I didn’t think that subject matter really fit. 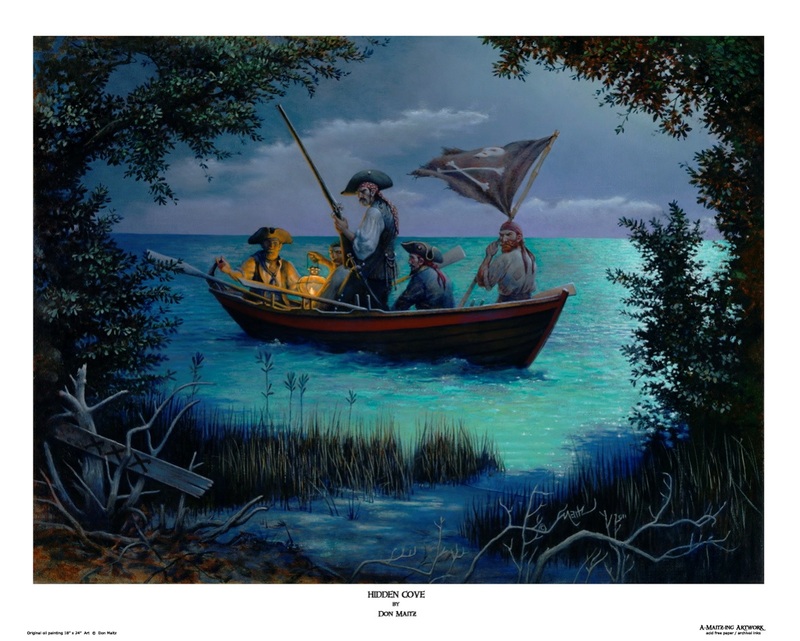 Illustrating what was going on in our coastal waters and treasure hunting, I thought pirates would be interesting subject matter for me to continue. Plus, some of my favorite artists have worked in that genre,” says Maitz. For this exhibition, Maitz printed some of his most notable pirate art to date using his Epson Stylus Pro 7800 on Sunset Hot Press Rag, LexJet Premium Archival Matte and Hahnemuhle Photo Rag 308 g.
Maitz sends his artwork – typically oil paintings and watercolors, though he works in a variety of media, including acrylics – to Eagle Photographics in Tampa to capture his work. Maitz cuts the prints by hand, rather than using the automated cutter inside the printer. He says it’s best to keep the dust produced by cutting as far away from the printer as possible; a clean printer alleviates potential headaches from clogged nozzles and cuts down on maintenance routines. Maitz has worked with LexJet as print supplier partner since he bought his printer. 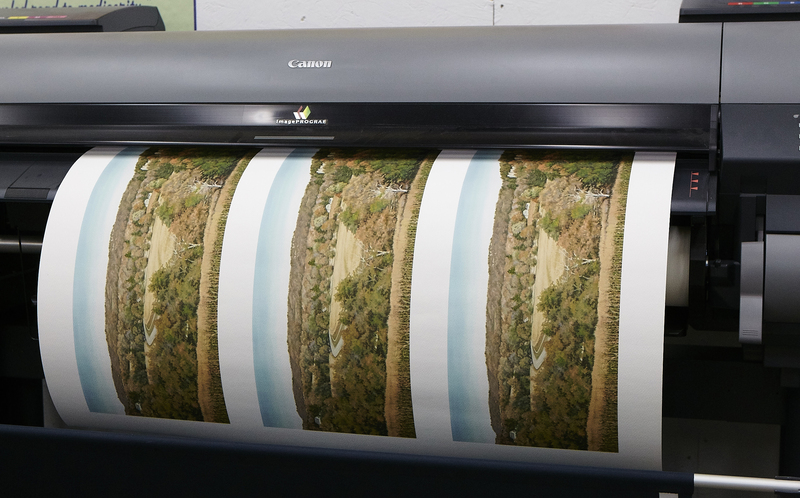 “What I really like about LexJet is that I place an order and it gets here quickly; that’s a real plus. Also, when I first bought my printer from LexJet, my learning curve was dropped considerably by help from my rep and technical support,” adds Maitz. Ken Gemes Interiors creates inviting, timeless interior environments for the discerning home owner, whether that owner is ensconced in the city or wants to revitalize a more pastoral location. Having recently moved to the firm’s new location in Mount Vernon, N.Y., founder and president Ken Gemes transformed a warehouse space into a showcase of the firm’s design expertise. One of the pivotal components of the new space is a 15-foot-wide by 9 1/2-foot tall conference room wall mural from décor specialist Soicher Marin, based in Sarasota, Fla.
Soicher Marin has developed a line of wall coverings called Wall Couture™ that combines LexJet’s Print-N-Stick Fabric as the base material with designs, patterns, photos, art and graphics from Soicher Marin’s extensive art library, each uniquely selected and custom-printed for the client’s environment. One of the benefits of Wall Couture/Print-N-Stick is its ease of use: it’s repositionable, removable and re-usable, and much easier to apply than traditional wallpaper or adhesive-backed vinyl. 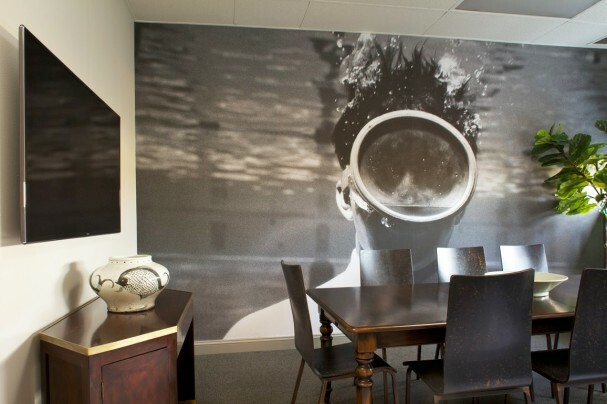 In this case, Soicher Marin printed the photograph, Man Under Water, in eight 28-inch-wide panels and sent the panels to Ken Gemes Interiors. The mural was printed on Soicher Marin’s HP Latex 260 Printer. Bellinder says the latex inks provide additional durability, and that scuff marks and dirt are easily removed with a Mr. Clean Magic Eraser. 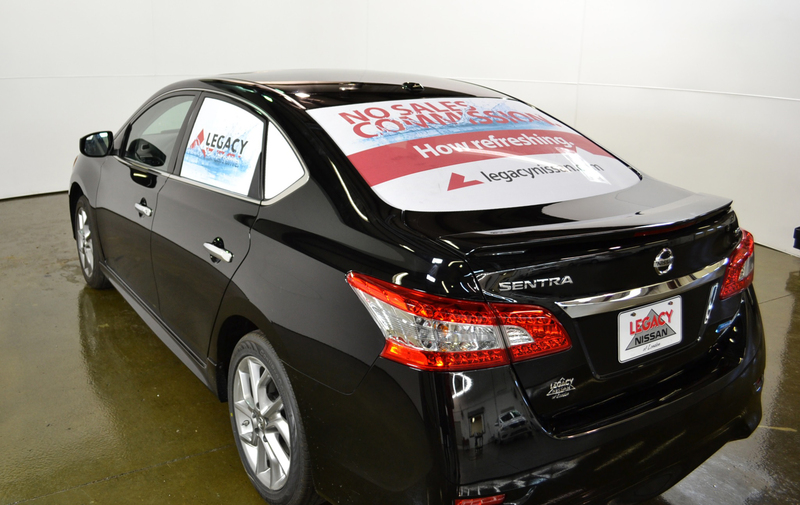 Legacy Nissan in London, Ky., has been effectively branding itself with larger-than-life brand murals applied to both its exterior-facing and interior windows. 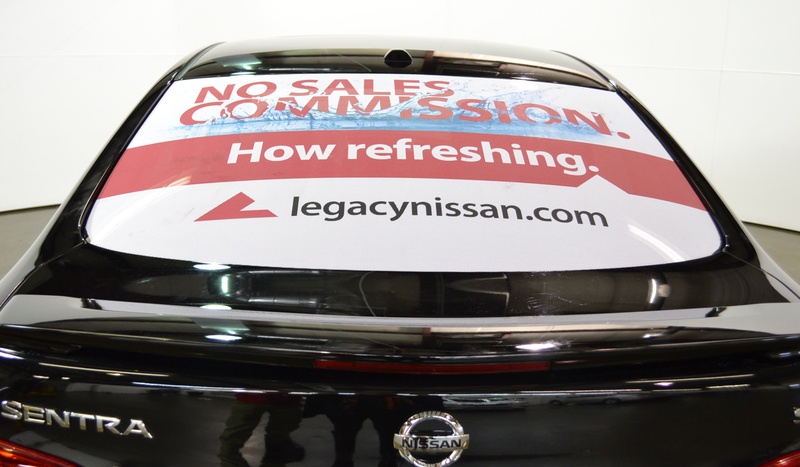 Though it continues to emphasize the Nissan brand, Legacy Nissan is also emphasizing specific services and promotions that help set it apart from other dealerships using LexJet Aqueous Perforated Vinyl (70/30) printed with an Epson Stylus Pro 9900. 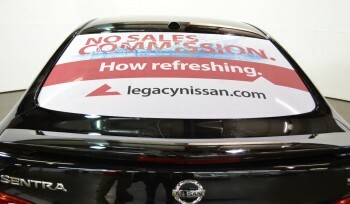 Pictured here is Legacy Nissan’s most recent campaign, highlighting the fact that its salespeople aren’t driven by commission using a simple, direct approach: No Sales Commission. How Refreshing. This is the message now front and center across its storefront windows, and displayed on the road with perforated window vinyl applied to the windows of the Sentra the dealership uses for official business around town. Tied into other marketing media, like social media and printed collateral, the new campaign is already paying dividends, says Legacy Nissan’s Missy Reid. There is no definitive rule for matching the right fine art paper (or canvas) to the original piece that’s being reproduced, whether that piece is oil on canvas, a charcoal sketch, a watercolor or any other medium. Ultimately, it’s based on the artist’s preference and their interpretation of the piece for reproduction. However, certain media generally translate into certain types of fine art reproduction materials. Obviously, oil on canvas will generally be reproduced on canvas. Of course, there is then the choice between a satin, gloss or matte finish, and any coating that may go over the canvas to both protect it and create its own finish (more on that in a future post, or you can download the free white paper, How to Make Canvas Printing Work for You). For fine art papers, veteran print maker Kent Foster, owner of Fostergraphs Inc., Decorah, Iowa, has two “go-to” papers: Sunset Textured Fine Art Paper 310g for those who want a more textured surface and Sunset Cotton Etching Paper 285g for those who prefer a smoother finish. “For the most part, we use Sunset Cotton Etching for pencil, charcoal and sketch work that’s more flat. We use Textured Fine Art predominately for watercolor reproductions, as well as oil paintings when they’re going to paper and not canvas because these artists tend to like a textured paper. And, they tend to work in textured medium to begin with,” says Foster. 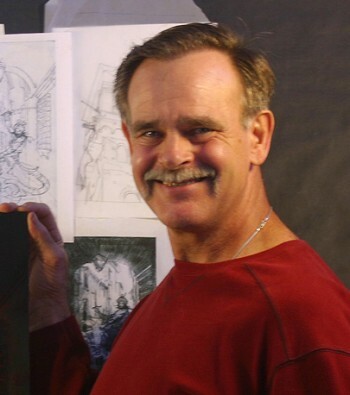 In the example pictured above, Foster reproduced a piece entitled Where Eagles Soar by award-winning water color artist Mary Ann Gloe. It’s one of four watercolors Foster reproduced for the Luther College bookstore to replenish their stock of Gloe’s work.